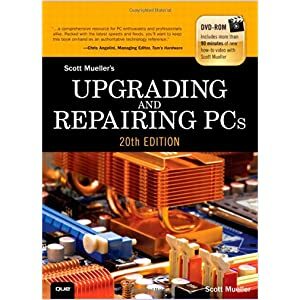 Scott Mueller's Upgrading and Repairing PCs Forum • View topic - New Books! Post subject: Re: New Books! Hate to bug you Scott, but any idea on when or if a 3rd ed. of UR Laptops will be published? I'm guessing any UR Windows 3rd edition will be pushed back to incorporate Win8?...which is looking better as an OS than I had originally expected. Windows 8 is better than I expected. I worked an overnight shift setting up 20 machines with it and the general public is being pretty receptive. I wish Scott could put out a UR Windows/Laptops every year but there is only so much time and supply/demand to go around. Don't worry Scott, we all look forward to what you put out and appreciate the continued hard work! Windows 8 is better than I expected. Like I said...better than I expected. That's a very relative statement. I think MS shot themselves in the foot with the roll out on this (especially the lack of downgrade options available at your typical retail outlet). Personally, i'm still sticking with XP or 7. It's much better with a touchscreen or tablet form factor, but then again there are tablets for that. I'm helping a friend track down an apparent issue with the app store being one of buggiest pieces of software MS has ever put out. Vista was awful in that Vista certified systems leaving the factory CRASHED. That is as bad as it gets. Win8 seems quite stable. WinME was also rather buggy and unstable (though I don't remember it as bad as Vista). If people are stuck with Win8 (you still have downgrade rights with Pro) then see ifa Start Back appwill make you happier. Microsoft is hard at work endearing itself to IT Depts. after announcing there will never be an (official) SP2 released for Win7. Nice. I'm not sure that 2nd place to Vista in awful-ness is a distinction they were seeking. <g> Scott. 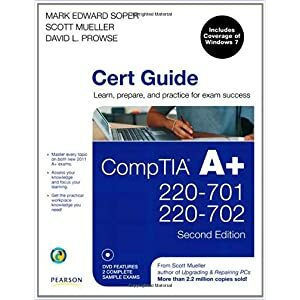 I passed the CompTIA A+! That's awesome, congratulations! Thanks for letting me know, Scott. so are you going to have any new books out for 2015-2026 or DVD videos. I'm getting boring with the DVDs I have now and the books i have now I have the 21st edition. 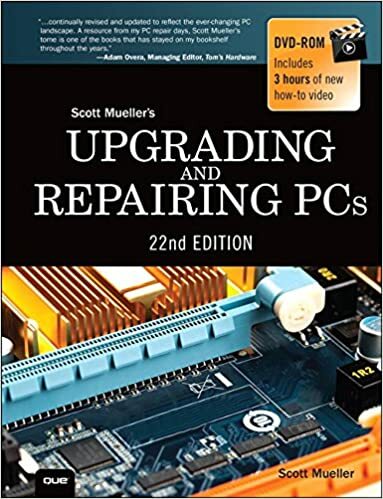 When are you going to have upgrading and repairing laptops 3rd edition. The 22nd edition is in the works for this year, so far we're not sure about a 3rd ed. for the laptops book. Thanks for your interest!! Scott. Scott, do you have any copies of the 22nd edition of U&R PCs for your special price that you offered before? Indeed I do. I'm going to make a special post about it, but until then anybody that wants one can PM me, the same deal applies as for the previous new editions ($30 including free USA shipping). Scott. Thanks Scott. I'll definitely be getting it when I set the money aside for it. CompTIA... is indeed a fun book to read and figure out the puzzles. So tell people. You really ought to spend a little time updating the Books thread. Maybe combining them. http://www.amazon.com/Upgrading-Repairi ... em_1p_0_ti - July 15, 2015 pub date? Could have sworn I searched Amazon between then and now? Maybe I missed the announcement here? I do need to update this topic, thanks for bringing it up! That is indeed the latest edition, and it has a new DVD with over 3 hours of content included. I have these available autographed for $30 each including free USA shipping. Scott. How do I order the autographed copy from you? I tried to email the "forum@scottmueller.com" and got a failed delivery notice. Any updates on new editions of your books Scott?. The 22nd edition is still the latest. I don't like to comment on future editions until they are very close to being released. Scott. See my previous post. Scott. Hello Scott... long time, no text to. <g> I was hoping to get out your way this summer, but sadly, my Dad passed away on March 28th, so that trip is on hold. I was just checking to see if/when your 23rd Edition of Upgrading & Repairing PC's will be out. I also have some more questions on the newer P-71 Lenovo Workstations. Do you still recommend Lenovo for a Workstation, or have you found something better? What is better... a laptop or desktop for a Workstation? I'm so sorry to hear about your Dad. Both my wife and I each lost both of our parents in recent years so I know how you feel. Note that my "way" has changed! We moved to FL (just north of Tampa) about a year and a half ago and love it. Shortly after we moved Irma scored a direct hit on our town, however it kind of fell apart when it got here and ended up being nothing more than a storm like we were used to up north. I guess we dodged a bullet! Unfortunately there is no ETA on that so far. I've been exclusively using laptops for more than 20 years now, a ThinkPad with a dock is both a laptop and a desktop for me. I use a lot of desktops for testing, but not as my primary workstation. A T-series will suffice for most but if you truly need workstation power than a P-series should fill the bill. Scott. Hey Scott, any chance of doing some type of video course again?. I still have your old one from I think 15+ years ago somewhere around here. Today there is so much wrong information out there on the Internet it's mind boggling. I've looked and always come back to you or your books for conformation. The majority of these Internet "Gurus" are flat out wrong and spreading mis-information like wild-fire. Thanks for all your help over the years. Please continue with your book series and maybe release a video course. Thanks for the kind words. I'd consider a new video course however at this point it appears to be unlikely. Scott. I hope you are doing good Scott and nothing bad happen to you. I hope you are going to update your books soon. The ones I have that are being outdated I have the newest one upgrading and repairing pcs 22nd edition.